You know what’s suspect? When you ask someone if a restaurant is good and their answer is, “well, they have a really good brunch.” Oh, so you mean they serve mediocre food five days out of the week, but then they totally step up their game for poached eggs and scones? F*ck, we should go. That’s pretty much the story with Cafe Colette. 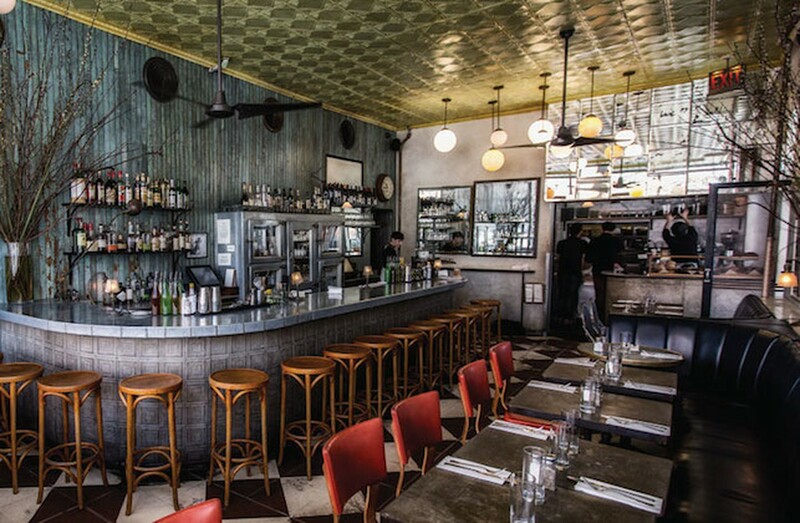 This place is always in the mix when people talk about brunch in Williamsburg. Not that we ourselves are participating in that conversation, but we do know a handful of 24 year olds. They love brunch. From what we can tell, Cafe Colette does seem to do weekend daytime food pretty well, and they also have a very good espresso and coffee bar situation set up. But what about the other five days of the week? Judging by the several meals we’ve now had here, this place is very average. Average except for one thing. The burger. I know what you’re thinking - every place like this has a good burger. They are, after all, a staple of brunch menus. But this one is seriously good. Best in Brooklyn good. Ready for the kicker? They do a great plate of brussels sprouts too. And would you be surprised to learn that they also have a very good cocktail menu? Didn’t think so. Isn’t this exciting? There are usually a couple of flatbreads on the menu at Cafe Colette, and I’ve decided I am definitely not into “flatbreads.” That word is usually employed in substitution for “pizza” or “food we’re going to overcharge you for.” And I’m pretty sure The Maccaroni Grill coined it. Skip them here, and also everywhere. A watermelon salad with mint, lime, chili, and ricotta salata. You could make this at home. This kale salad is reminiscent of a Caesar, and it’ll do just fine for the evening. A linguine and clams dish that we couldn’t finish, not because we were full, but because it wasn’t good. This whole fish is a decent option for those of you who don’t eat meat but get dragged here with someone who wanted a burger. This is the thing to order at Cafe Colette. The burger here is absolutely fantastic, thanks largely to some Big Mac-style special sauce, and a nice pillowy sesame seed bun. We prefer ours with Fontina cheese on it, but you can have American or Cheddar if you like. You’ll be happy regardless. There are olives in these brussels sprouts, and I know how some of you think olives are grody. Don’t you worry, you can pick them out and not know the difference. But for those of us who are out of the fourth grade now, we actually like this combination a lot. Order ’em up.